It was rather uncouth of me not to thank Stephanie of faiiinted.com properly for the effusive account about me. It's been a rather pointless exercise trying to multi-task AND getting distracted every few minutes by a rather precocious child over the summer holiday which meant that things fell through the cracks. Thank you, Stephanie. I wanted to cover 3 inspirational women which I've admired from afar. We are often envious of successes that certain individuals have achieved without any knowledge of the setbacks nor obstacles that they had to face. More importantly, I hope they may inspire you in more ways than one. You may have noticed a slight pattern here. I have a tendency to promote Antipodean bloggers. Briony is an Aussie living in Cambridge and works as a senior political advisor in London. It's more of a journal rather than a strictly fashion blog. Her blog has grown from strength to strength within 2 short years. It has won 2 major awards, handpicked by Jimmy Choo to front their online project called 24:7 Stylemakers, she has sat on the front row of fashion shows during LFW - all before she turned 30. Her blog is peppered with stunning photos and wonderful stories about her travels, fashion tips, personal account of her life to name a few. The first time I stumbled upon her blog, I went through 21 pages in one seating. The girl sure knows how to captivate her audience. I've been following Daphne, a Filipino Canadian since her early Flickr days before it transitioned to a blog. She's a mom of 3 adorable little girls, TV producer/host, businesswoman with her range of linen, furniture and home fragrance, UNICEF ambassador and a blogger. I feel exhausted just listing the many hats that she wears. I'm often left staggered and awestruck by her can do attitude, forthright manner, humility and her deep love for her family which she often talks about. While most of us often wish we can do more to help, she actually finds ways to help. Last December, the Philippines was struck by a horrific tropical storm (Typhoon Sendong) which left 1000 dead and countless homeless. Daphne single-handedly spearheaded and coordinated foreign aid worth approximately USD 100 000 to restore clean water with assistance from Canada's Global Medic and the navy. All via twitter and phone calls. Let's not forget that her action saved thousands of lives. Ingrid of The BagHag Diaries is no stranger to most of you. I interviewed her earlier this February (click here to read) and had a fun time doing so. I had a chance to catch up with her face to face a few months ago with Ingrid when she made a pit stop in London before heading back to the Philippines. Despite her glamorous facade, she's the kind of girlfriend you want to have. Down to earth, witty, funny and sincere. We spent the next few hours chatting non-stop and laughing hysterically which probably annoyed the restaurant patrons who had the misfortune to pick the tables next to us to no end. She's a mom of two, a former colleague and close friend of Daphne Osena Paez, runs two blogs and a boutique. They are the top bloggers in the Philippines without a doubt. Ingrid started her blog in the early days when weblogs were still relatively unknown. Her stratospheric success within the fashion world was accomplished through sheer grit and hard work. She covers Milan and Paris Fashion Week which is no easy task considering the fact that she has two boys and spends more time on a plane than most of us ever will. What a wonderful post ... I’m all about inspirational woman. I am checking out their blogs now. Happy Friday! I always look forward to this post and thanks again for always sharing such great blogs! Have a wonderful weekend Marlene! 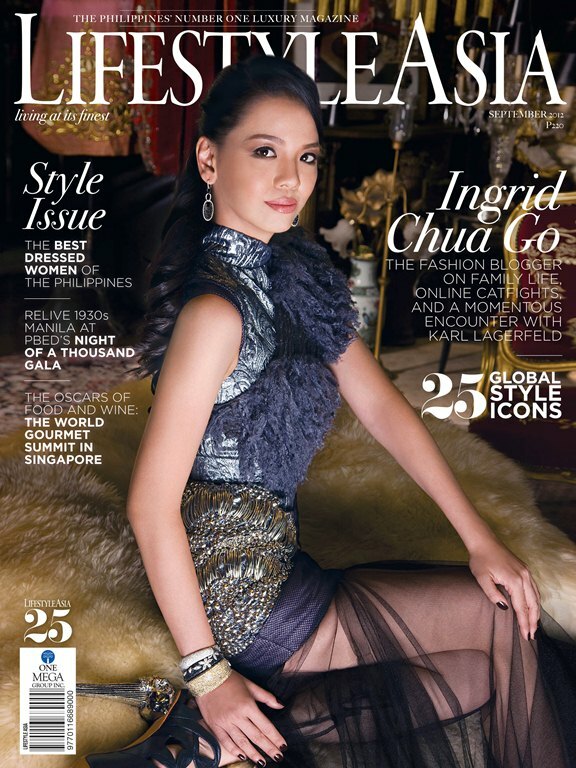 can't wait to check ingrid's blog she looks gorg! hope you have a great weekend, happy fri! Lovely picks. Briony has a lovely style doesn't she. How she rides on that bike with those heels I don't know. You have absolutely nailed it with these blogs. I hadn't come across them (I've been under a rock that's all I can say). I love them all! Thanks so much for the introduction to such inspirational women who blog. Aw, thankyou for the mention Marlene! :) Again, so many wonderful blogs here, I'd heard of one but not the others so thanks for introducing me to them! I love the text accompanying each one, it makes for such inspiring reading & Daphne's story has left me in awe, what an amazing lady! wow, definitely an inspirational bunch! briony's blog is rad - and i already read ingrids! Yay for inspirational women! It's great when you find inspirational women in the blog world. I always enjoy Briony's blog- such a breathe of good positive energy.